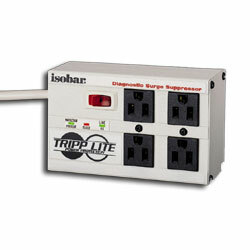 Tripp Lite's Isobar 4 AC Outlet Premium Surge Suppressor is ideal for protection of computers, networking, and telecom equipment. Sine Wave Tracking closely monitors surges providing a consistent, high level of protection regardless of where the surge occurs on the waveform. 2 Isolated filter banksprevent system crashes, reboots and performance problems common as noisy peripherals are powered off and on.